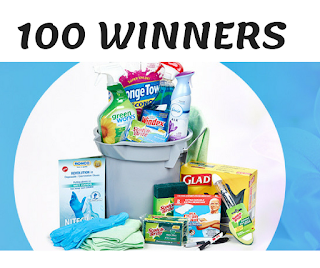 100 Hamster house-cleaning kits Available to Be Won! 100 Lucky winners are going to be getting a prize pack in the Hamster Moves in Contest! Each prize pack kit is valued at $80- Each kit is filled with cleaning products, sponges and more!! Each kit includes: one Brute® Pail Bucket, one pack of 2 Sponge Towel® Econo Paper Towels, one Febreze® Air Effects® Air Refresher, one pack of 3 Scotch-Brite® Scrub Sponge, one Green Works® All-Purpose Cleaner, one Windex® Glass Cleaner, one pack of 4 Mr. Clean® Magic Eraser, one pack of 20 Easy Tie® Garbage Bags, one Scotch-Brite® Heavy-Duty Dishwand, one pack of 3 Scotch-Brite® Scrub Sponge, one pack of 4 Scotch-Brite® Scour Pad. You have to be at least 16 to enter and you can enter weekly for your chance to win 1 of these prize packs. Ends July 31, 2018 Enter to WIN!